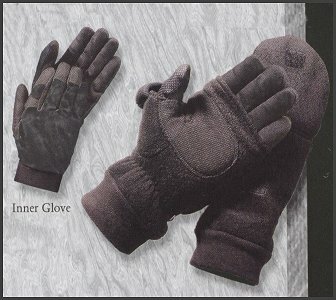 The System Glove™ is perfect for the forklift operator or inventory specialist that needs to stay warm and use their fingers to use a keypad or write. The System Glove™ combines a high-quality form-fitting mechanics glove insert for feel and dexterity, plus the warmth of a mitten that contains our exclusive RE-tain™ technology. The unique inner glove’s palm is made from Clarino®, a leather-type synthetic that is form fitting for superior dexterity, providing better feel for grasping a pen or punch in inventory codes by simply flipping back the end of the mitten when needed. When finished just pull the hinged mitten back over the fingers to capture body heat and stay warm with our exclusive RE-tain™ technology. There’s no need to heat the System Glove™ before using them again; they will not maintain the cold like traditional insulation.